2 each of our original Felt Alive Single Point Felting Needles plus 1 each of our fabulously fun DOUBLE Point Felting Needles. With our Felting Needle Fun Pack you are sure to have plenty of needles to last through many fun projects. Love the needles, very comfy grip, strong. I am going to order another pack soon! The best thing about the felting needles is the grip. Many finger pokes have been prevented by being able to hold and work with the needle held securely in your fingers. Can’t wait to try the new one. I just wanted to tell you how much I enjoy your felting needles. I have used several other brands and have found yours are much more comfortable as well as great at getting the job done. I have several different ones in my needle cushion and I always find myself reaching for yours! Just bought another set and am very happy! 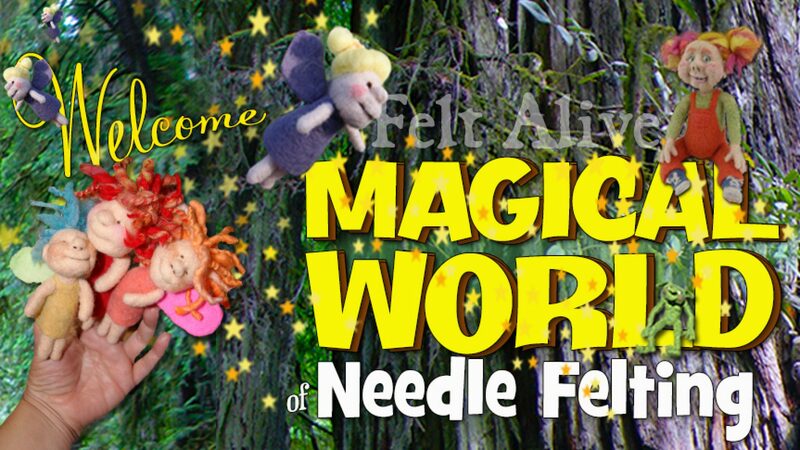 I LOVE Felt Alive’s Felting needles! They are pretty much all that I use. I love the soft handle that is just the right thickness! The double point needles are twice as fast, with the terrific comfort factor. Totally worth it! Once you try these you won’t want any other felting needle! This is a great kit with everything in it. I use both the singles and doubles in ALL of my Custom Sculptures! You’ll LOVE them!! I ordered this Super Duper Fun Pack for the grips and the way you described the needles. I’m new at needle felting and I have only used two other brands of needles. I have to say, I ADORE THESE!! I just got them in the mail today(7-19-2012) and I tried them out right when I got off work!!! Simply love them. They got here super fast too! Thank you for these!!! I LOVE these needles! I use the yellow and the black the most. They really are the best needles I’ve ever tried! And the comfort grip is a felter’s dream! I won’t use anything else since I’ve tried these!! Best needles I’ve tried! I love that they’re color coded AND super comfortable to use. Thank you so much in introducing me to a great art. I have needle felted a few items mainly animals. one which iam proud of an Airedale.It was Auctioned off on the Airedale rescue site and fetched 120.00 for the cause. This felting needle selection is just what I was looking for to explore felting. The service was super quick and the needles are exactly what I was expecting. Thanks! Great online shopping experience. The needles are very comfortable to use. I’d next like to try the multi-point. I am very new to needle felting and found these to be the best needles!! Kay has helped me so much!! LOVE, Love Love these needles. They are comfortable to use and clearly marked on the packaging as to the use of each color code!! These are the BEST needles. Easy to hold, work wonderfully, and they do more than I expected!!! Great needles. I recommend them to all. The grips are fantastic and make felting so much more comfortable. New to needle felting but so far these are the best needles I have tried. Love the double needles makes the work go faster. My bigginer pack of needles! So much better then needles you buy at the craft store! the double point needles are so cool I used them alot and have had them for a year now! I recomend these to anyone they make you felt like a pro. I wouldn’t use any other brands to start learning with! the quality is great for years to come, a good price too! I am a beginner felter but I ordered several kinds of needles from various sites to learn and see the differences. I totally love these needles and the rubber grippy tops are wonderful! I ordered another set the other day! If you try them, you will love them! I cant begin to tell you how TERRIFIC that ALL these needles are!! !I am a COMPLETE beginner to this wonderful hobby and I was using the “generic” needles that come with the little kits that you can get here and there online. The difference in my work and ease of my work was like night and day with these needles!!! I wrote down which needle was for what work based on the color code and used them like that and they are just SOOOO wonderful! I will be a repeat customer!!!! LOVE THESE NEEDLES! Will be ordering more!